Darq E Freaker, Nina Las Vegas, and Daktyl all turn in takes on cuts from the producer’s latest. 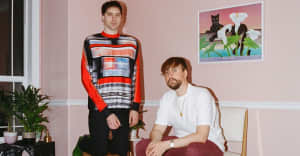 Machinedrum dropped his excellent new album, Human Energy, in September. Now, he's shared remixes to a pair of collabs from the album. "Do It 4 U" which features D∆WN gets a pair of remixes here, including a n amped-up take from Darq E Freaker and a version from Daktyl that builds from more subdued territory into heavy, double-time drops. "Angel Speak," a team-up with Lemonade contributor Melo-X, also gets the remix treatment from Australian DJ and tastemaker Nina Las Vegas, although that track isn't streamable in the States. In any case, you can listen to at least two of the remixes below.